As you may know, in the fall of 2018, our world felt like it fell apart. Our sweet, loving, silly, 6 year daughter, Adleigh, was diagnosed with Childhood Absence Epilepsy (CAE). Adleigh's team of doctors say, "if she is going to have Epilepsy, this is the kind to have..." While she is doing better with the help of some medication, we are still trying to find the correct dosage. 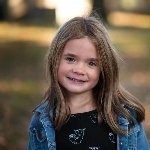 We cannot help but be changed by Adleigh's diagnosis - she is now our Epilepsy Warrior. She may be 6, but she has taught us so much during this short time.